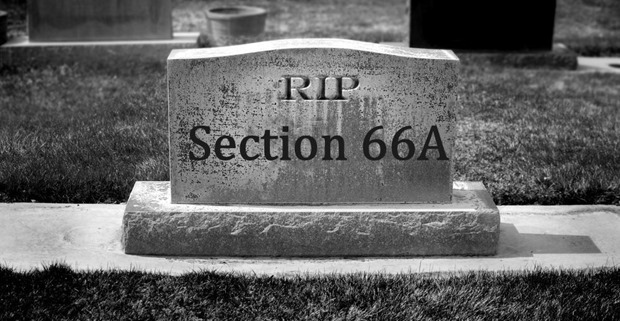 RIP Section 66A, Supreme Court Terms It Unconstitutional! Slowly, but gradually, a scenario was developing in India where online citizens were becoming afraid of sharing their opinions and views. People were being arrested due to Facebook posts and blogs, simply because their world view was different from the politician’s or police’s worldview. In a landmark decision made by Supreme Court today, Section 66A of Information Technology Act, which was used to arrest people for sharing content online, has been scraped and termed as “unconstitutional” by the apex body. Several victims of this draconian law had been subjected to torture and arrests in the last few years, and they had petitioned their case in the Supreme Court, challenging it’s operative. The first PIL was filed by Shreya Singhal, after two young girls were arrested by Mumbai police in 2012 for posting critical comments on Shiv Sena supremo Bal Thackeray’s death. After that several NGOs, individuals and writers had joined the movement. A bench of justices J. Chelameswar and R.F. Nariman from Supreme Court had reserved their judgment on February 26th and announced it today morning. As per the ruling, any online content can be blocked or action can be taken against the creator of that content, in three cases: The content can create communal disturbance, social disorder or affect India’s relationship with other countries. Class 11th student from UP was recently arrested for sharing his comments on hate speech delivered by UP Minister Azam Khan. Instead of arresting Azam Khan for spreading hatred, police arrested this 11th class student for his views. We congratulate the Supreme Court for restoring our faith in the Indian democracy and to support Free Speech.